I experienced a problem this week that served to underscore the problem with blame. My wife Gimalle and I live in a two-tower condominium complex and I have served as a member of the Board of Directors for the past 12 years. Gimalle, while not a member of the board, is enormously active in helping with many of the issues that condo board members deal with. A few years ago, we had a suite in one of the buildings suffer extreme damage when the kitchen sink backed up and flooded the entire unit. Water issues are not uncommon in high-rise towers. We have personal experience with these matters as 14 years ago our previous home was destroyed by a flood and we lived in a hotel with 12 weeks while it was being repaired. That experience has provided us with extreme empathy for what people go through when their homes experience extensive damage. What made this particular flood stand out was not the extent of the damage, nor their reaction of the resident, it was the way in which our management company, plumbing contractor and drain cleaning company responded when informed of what had happened. Our management company immediately pointed a finger at our plumbing contractor explaining that they knew of the problem should have addressed it sooner. The plumbing contractor insisted that culpability rested solely with the drain cleaning company as they clearly had not done their job properly. The drain cleaning company maintained that they had fulfilled all the requirements of the job as given to them by the management company who, therefore, were responsible for the whole mess. I don’t know if in fact there is any blame to be apportioned, but what was most concerning to me was to observe the lengths to which they went to deflect responsibility away from themselves and redirect in the direction of others. We all make mistakes, and will continue to do so. 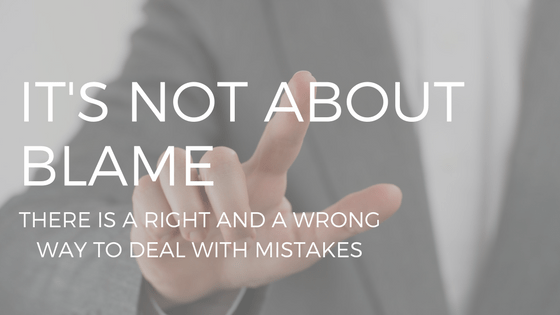 There is however both a right and wrong way of handling mistakes when they are made. What I have described in this flooding event is a graphic example of the wrong way. Unfortunately, as society becomes more litigious, the price of bearing responsibility and accepting blame may be high. Yet, even a high price should never be a deterrent for ownership of our own behaviour. Our character is not built on how we conduct ourselves when everything is going well. Rather, it is defined by what we do when things are not going our way, when we are dealing with extreme adversity and when presented with an opportunity to acknowledge our errors and shortcomings and assume responsibility for making things right. And yes, we may pay a price for doing. But always remember, acknowledging mistakes is not a weakness, it is a strength as it takes tremendous courage and character to tell the world we messed up, and then do what it takes to turn a bad situation around. So, as I think back to the management company, the plumbing company and the drain cleaning company, I have but one question: What is the real price for a business, when faced with the decision to acknowledge some degree of responsibility or deflect blame at all costs? Is it worth compromising your relationship with existing customers and clients? Does it help with your branding? Don’t ever get me started to how quickly social media can make or break your business? Of course, I can’t answer this question for any of the owners of those companies. I can only tell you how my view, and that of my fellow condo board members, of them has changed. Never underestimate who knows who and how many times a story is retold. Perhaps they care nothing of what we think of them but what they will never know is how many times we will tell this story to others and among those others are people just like us, who, as condo board members, decide who can and who cannot do work in their buildings. We will never escape from being mistake-makers, but what if when we make a mistake, instead of immediately jumping to blame and damage control, we instead chose to reflect on the situation, ask where and how I contributed to the outcomes, and armed with that information, promised to learn from the situation so we could do better, and, ultimately, be better next time. Now that is a business I would hire.